Please come back to the site often, as we keep it updated with new pieces as we make or import them. In our Bedfordshire factory we make concrete balustrade and additional columns. We import quality Italian marble composite fountains and statues. 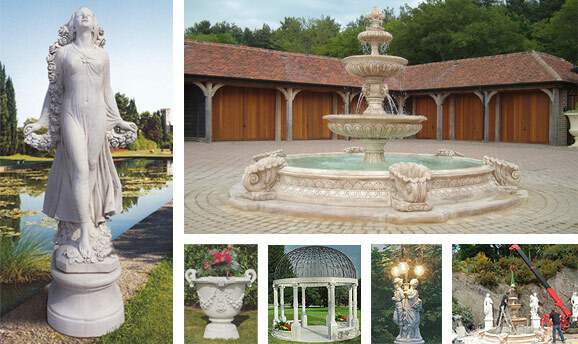 Mattstone has been importing fine Italian garden marble composite ornaments for over 15 years. We pride ourselves with the quality of products and service we provide. We have a crane high ab vehicle to aid us with deliveries in addition to pallet delivery services, all fully insured. We have with hands-on experience in the installation of the superb decorative fountains we sell. Call us for advice on choosing the right fountain for your home or public garden. We manufacture garden and patio cement balustrade in our factory in Bedfordshire. Delivering throughout the UK.